I don't think it's worth it to first pay for a low cost creature, then sac it and pay UG to search for a pretty vanilla creature with 5 power. Why not just play Tarmogoyf then? Mark my words: One day we'll get a mechanic called "last strike" and there will be a 3/1 zombie for 1. Generic zombie tokens and the stupid zombie army tokens shouldn't be able to fly like that! This is a big flavor fail! 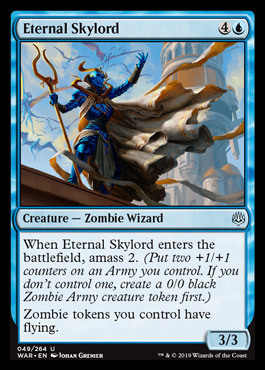 Unconventional Tactics was at least a bit funny and just one creature until end of turn, but the Eternal Skylord is too much for my taste. That said, in Commander you already could play Archetype of Imagination, Levitation or Wonder in your Gisa&Geralf Deck. So it doesn't change much. I'm pretty sure they meant Skyshroud Cutter. Yeah - sorry that was me, and yeah I accidentally combined both words. But for real. I've been calling this for a decade plus now. I collected on a 13 year old bet when Unstable came out, lol. Yeah, I mean, it's plausible. Last strike in particular, since it really makes sense. I think the biggest issue is that the name just sounds kind of stupid (triple-strike too though). Lumbering, slow-strike, or a play on inept are some keywords I could see them using. You're right, tutors are better for combos. So maybe Cephalid Illusionist/Shaman En-Kor make for better fetch targets, but I'm not sure that that qualifies as an "abuse" of the tutor. Rector Fit will like Neoform. Turn 1 Veteran Explorer, Turn 2 Neoform out an Incubation Druid saccing explorer generates 8 mana on turn 3 that can be used to hardcast any of the giant spells that Rector Fit has in hand. Plus it doubles an another way to sac a Rector. Damn I think you just broke legacy! Whenever you cast an instant or sorcery spell that targets a creature you control, exile that card instead of putting it into your graveyard as it resolves. If you do return it to your hand at the beginning of the next end step. best card to pair this with is Psychotic Fury - you have a draw engine and essentially give feather permanent double strike. Then eventually use with Seize the Day and double attack with her. This card seems pretty powerful within the set itself (i.e Standard or Limited), as there are tons of instants/sorceries that target your own creatures. Defiant Strike, for example.